The reviews are independent, detailed and recent. I am a 15-handicap golfer and discuss the courses we play with regular golf buddies down here. Then I summarise the review of each club/course. We focus only on courses in the Costa del Sol (between Gibraltar and Málaga). We have no financial links - direct or indirect - to any club. I mainly provide information for each course played off the Mens Yellow tees. The reviews are for all levels of golfers (low handicap, medium handicap, high handicap). I try to be fair to all courses reviewed, covering things that most reasonable golfers will find nice or disappointing. Click the Reviews button to select course reviews you want to read. 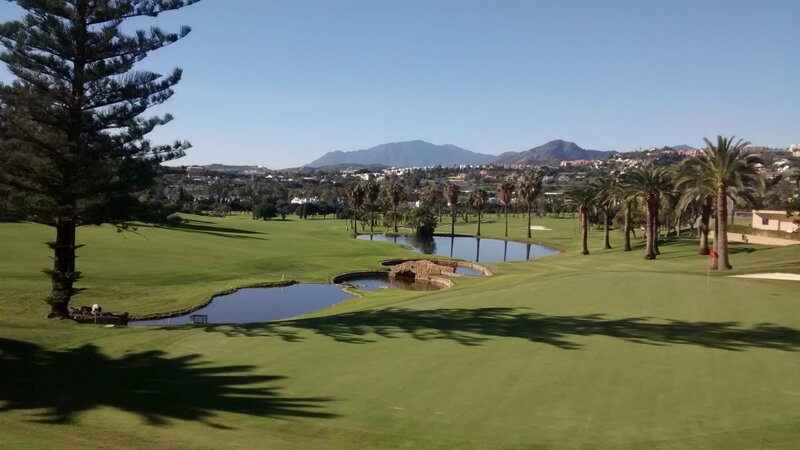 Click the More button above if you want helpful additional information about golf on the Costa del Sol. That section covers: cost of golf on the Costa, recommended courses, 9-hole courses and more..... The whole site also has plenty of clickable links. For example, if you move your mouse over an image, you may see a red spot that you can then click. This Web site is also 'Back Button Friendly'. Use the Back button in your Web browser freely - this site will not attempt to trap or stop that. Our unique analysis of courses by length and difficulty allows you to easily compare all courses on the Costa together in one simple graph. You can print off pages from this Web site using your Web browser File->Print option. You can also download and print our PDFs listing courses with maps. We provide links to mapping sites (Google Maps, Bing Maps) for each golf club. The Web site for each club typically provides detailed directions.